For example, you can outline how you want your funeral to be carried out, whether you want to be buried or cremated, what happens to your property, how your dependent children will be provided for and what happens to any treasured possessions you may have. You are entitled to make a Will yourself, however it is best and not expensive to have it completed by a lawyer to ensure that everything is in order and that the Will is properly signed and witnessed. Otherwise, there is a risk of problems with the granting of Probate, or that the legal validity of your Will is challenged at a later date. Signed by you (the Will maker). Should you die without a Will, your estate will be divided up by the Administration Act. 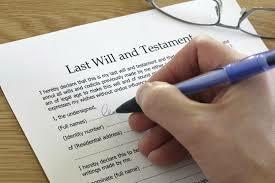 Dying without a Will is called dying “intestate”. When a person dies without a Will, administering the estate is more complicated than if the person had left one, and due to the complex nature, additional information will be needed to submit to the Court and can cause significant delays in the eventual distribution of the estate assets.